An exceptional showpiece door, rare, stripped pine internal, six panel, Georgian door with architrave for both sides of the door. The door is a beautiful example of Georgian design, with attractive mouldings and raised and fielded panels both sides in differing sizes and solid, well constructed joints. The door is very thick, heavy and solid, illustrating the quality of design from the era. The door comes with 6 pieces of architrave to frame each side of the door, 4 large and 2 smaller pieces to frame the top and sides. The pine architrave has classic mouldings and is the perfect partner for the door. The architrave will need to be cut to fit the doorway. 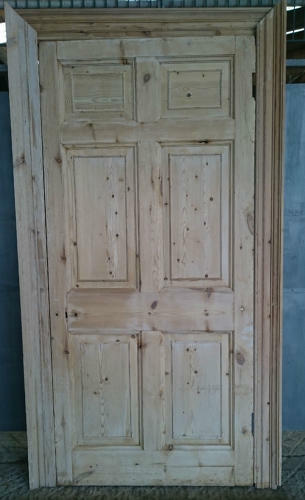 The door and architrave is stripped and ready for finishing by purchaser, either with a wax, varnish or paint. As the door is antique there are some signs of wear and light damage. The door has some damage to one top edge, with a crack to the wood, please see pictures for details. There are some knocks, chips and small spilts. Small holes and marks where the door hardwear has been removed. The architrave has some splits, missing beading, knocks and wear and may need some restoration. Some slight colour variation in areas. There are hinge cutouts that we can patch repair for an EXTRA CHARGE, please contact us for a quote. The door and architrave has a wonderful period look and it is rare to find such a solid and well constructed Georgian door. A perfect door for a period home.